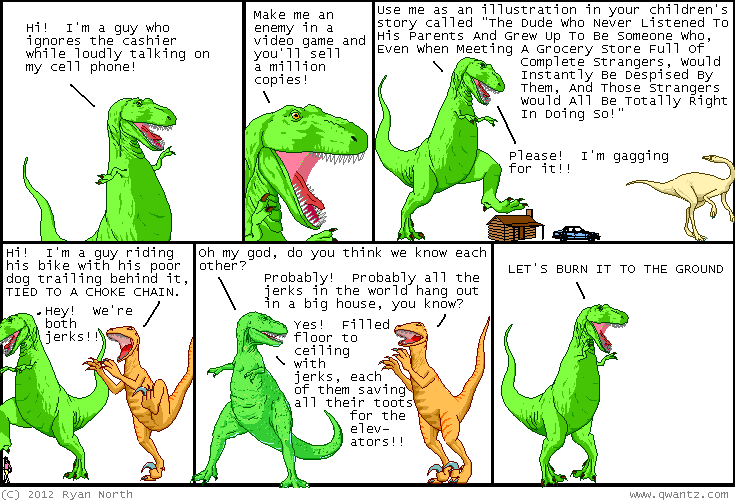 Dinosaur Comics - May 8th, 2012 - awesome fun times! –The freshest words keep falling out of my head! You're amazing. But how precisely amazing are you? This shirt lets everyone know. Written in consultation with my Actual Doctor friend, this shirt has fully-accurate information how how amazing you really are. We really did do all the research and calculate all the math. Did you know that if someone ate you they'd gain about 110,000 calories of awesome with over 73000% of their recommended daily intake of Vitamin A? Did you know you come complete with about 6L of air contained in a matching set of meaty carrying cases, 1000 different species of bacteria on your skin alone, one (1) SPOOKY SKELETON, and one (1) liver, uncooked? Because you do! Look, you're amazing. We all know it. NOW. Because you bought this shirt. One year ago today: let's ignore the difference between geological, magnetic, geomagnetic, instantaneous and political north poles and focus instead on the homey sign in t-rex's kitchen: "not necessarily tacos, but tacos if necessary"